​Those who have never been to North Platte, Nebraska might not know that this town is loaded with attractions related to Buffalo Bill Cody. 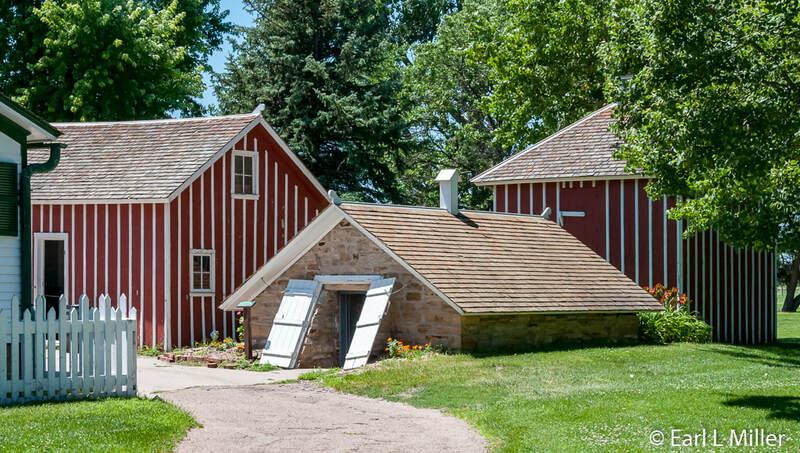 You can tour his home and barn, known as Scout’s Rest Ranch, at Buffalo Bill Ranch State Historical Park. You can visit Cody Park, the site where the birth of his famous show occurred. 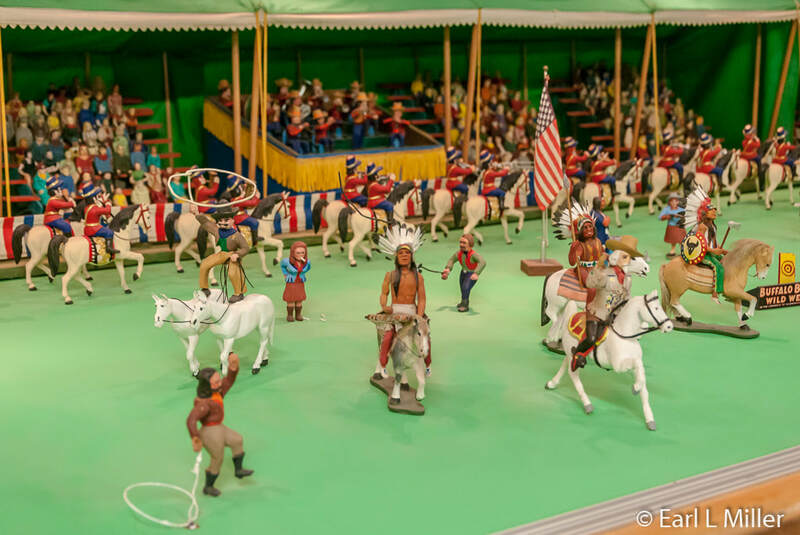 At Fort Cody, Nebraska’s largest gift shop, a highlight is their miniature hand-carved rendition of Cody’s Wild West show. While most people remember Buffalo Bill Cody for his famous show, he led an exciting life as a scout, buffalo hunter, and Indian fighter. In July, we had the good fortune of meeting Bruce Richman, a Buffalo Bill Cody reenactor, at Buffalo Bill Ranch State Historical Park. He filled us in on the details of Cody’s life with several fascinating stories. Born in LeClaire, Iowa in 1846, Cody moved with his family to the Kansas Territory. After the move, his father, who held abolitionist views, was attacked and died of stab wounds. At age 14, Cody joined the freight firm of Russell, Majors, and Waddell for whom he escorted 15 to 20 wagons. He would ride ahead and return to tell the foreman if there were any problems along the route that followed the Platte River Valley. He did this for six months. Although it is stated by many sources that Cody joined the Pony Express and made one of their longest rides, some historians dispute that he ever rode for that company. The typical Pony Express ride was usually 60 to 100 miles to the next station. It is said that on Cody’s trip, since the rider, who was to take over was not there, Cody continued on - a route of nearly 200 miles. He also did the entire return route as the rider he was meant to replace had not appeared. Cody enlisted in the Army during the Civil War and served with the 7th Kansas Cavalry. He was honorably discharged in 1865. He reentered the service and served as a scout at Fort Ellsworth in 1866. One of the people he scouted for was George Armstrong Custer. He took a leave of absence in 1867 and hunted buffaloes for the Kansas Pacific Railway to supply construction workers with meat. This continued into 1868 when he had his famous hunting contest with William Comstock. Cody and Comstock competed in an 8-hour buffalo hunting contest. The winner was to receive the right to use the name “Buffalo Bill.” Cody won by killing 68 animals compared to Comstock’s 48. Comstock chased after his buffaloes, engaging from the rear of the herd, and leaving a trail of killed animals spread out more than three miles. Buffaloes head for water when they are spooked. Brigham, Cody’s horse, headed right for the water. Cody rode his horse to the front to target the buffalo leaders, forcing the followers to one side. When they circled, they became an easy target. Bruce advised us that Cody’s real rank was private first class. He became an honorary brigadier general when he was stationed at Fort McPherson where he was chief of scouts. His job in 1872 was to take the Russian Grand Duke Alexei Alexandrovich on a four-day hunt. The army didn’t want a private taking the Grand Duke on this adventure so gave Cody an honorary rank. The National Guard Museum in Seward, Nebraska has a certificate of this. Cody liked to name a lot of his possessions after people. He called his favorite hunting rifle Lucretia Borgia. His horse’s name was Brigham after Brigham Young. While serving as scout, buffaloes were often butchered in the field with the heads being saved. The tongues were delicacies sent to the East Coast. There were originally 40 million buffaloes on the plains. Killing 20 of them a day often took place not only to provide meat but to prevent Native Americans from surviving because of their dependence on this animal. Eventually, the buffaloes declined to only 500 animals left in the wild. In 1869, Cody met Ned Buntline, who published a story based on Cody's adventures in Street and Smith's New York Weekly. Much of it was fictionalized. Buntline then published Buffalo Bill, King of the Bordermen. It was first serialized on the front page of the Chicago Tribune cementing Cody’s fame. Buffalo Bill Cody later wrote his own autobiography. Cody Park, which you can visit in North Platte today, was where the Wild West Show got its start. Known then as Dillon’s Racetrack, a committee of the town’s citizens, including Cody, organized a Fourth of July observance in 1882, now known as “The Old Glory Blowout.” Around 1,000 people came from all over the state. Activities included bronc riding, steer roping, and horse racing. This event was the first “Spectator Rodeo” and earned credit as the father of the American rodeo. Many of the 1882 events still take place in modern rodeos today. The success of the “Old Glory Blowout” inspired Cody to organize a traveling western exhibition. New acts included Indians and a band. 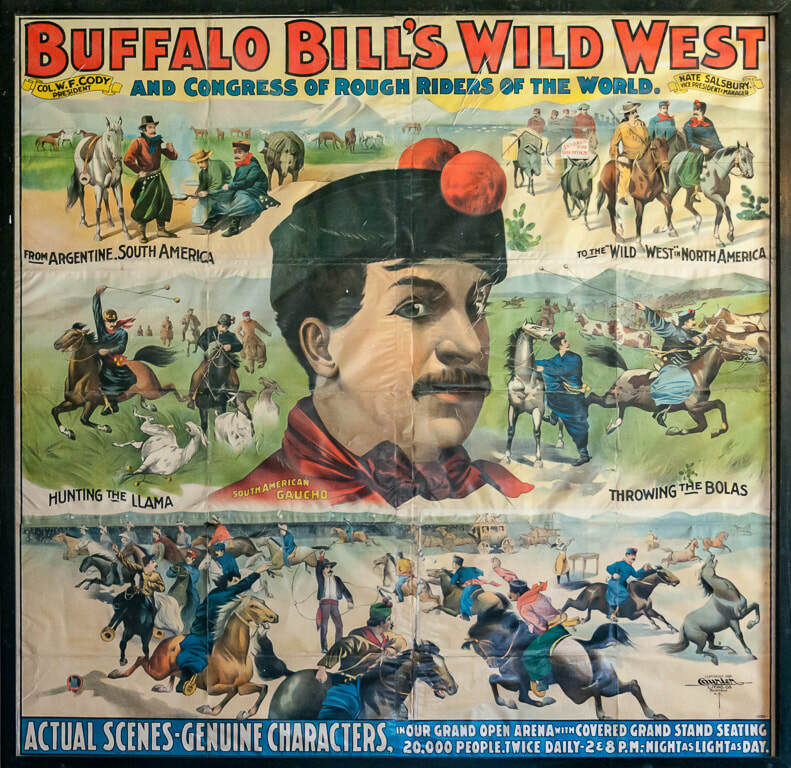 The first full dress rehearsal was held on May 10, 1883 with the first public appearance of Buffalo Bill’s Wild West Exhibition in Omaha on May 19, 1883. In the United States, trains were used to haul the entire show including horses, buffalo, and elk. Ships were used to take everything to Europe. Over the next three decades, the show appeared before millions of spectators in all 48 states and Canada. The troupe appeared in parts of Europe on several tours with the first in England in 1887. As owner of the show, Cody was a proponent for women’s rights. He hired a lot of women and paid everyone the same. Native Americans were all going to be placed on reservations. Even after the United States government declared that, Cody still hired a few. However, that was when he also employed cowboys from various lands - Russia, Brazil, China, and Mexico - to be part of the show. Cody’s last year on the circuit was 1916. When he died on January 10, 1917 of kidney disease, he was buried on Lookout Mountain near Golden, Colorado. Golden wanted to have the grave as it was a good crowd draw. Cody, Wyoming and North Platte threatened to take the body away so his and Louisa’s graves were encased in concrete. Louisa died in 1921. To learn more details of his life, go to my October 19, 2014 “Buffalo Bill and Golden” article. 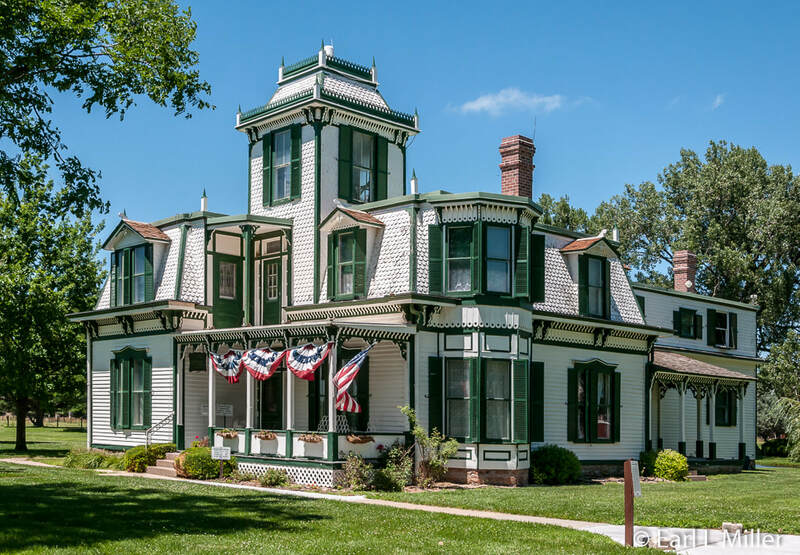 While in North Platte, head over to see the Cody home at Scout’s Rest Ranch constructed in 1886. It’s a Second Empire style residence with Italianate and East Lake features. Julia Goodman, Cody’s sister, planned the two-story home. Buffalo Bill’s requests were that it be finished in six months (October 15 at the latest) and that the porch be 10 feet wide instead of the customary six feet. He also wanted it to contain a parlor and a bedroom with a bathroom. No money was spared in building and furnishing the home. With carpeting and furniture, the cost was $6,000 with the price of the home being $3,900. A rear addition occurred in 1909. Cody had hoped to retire in 1886 and become a “gentleman farmer.” He thought of the ranch as Scout’s Rest Ranch and called it by that name. 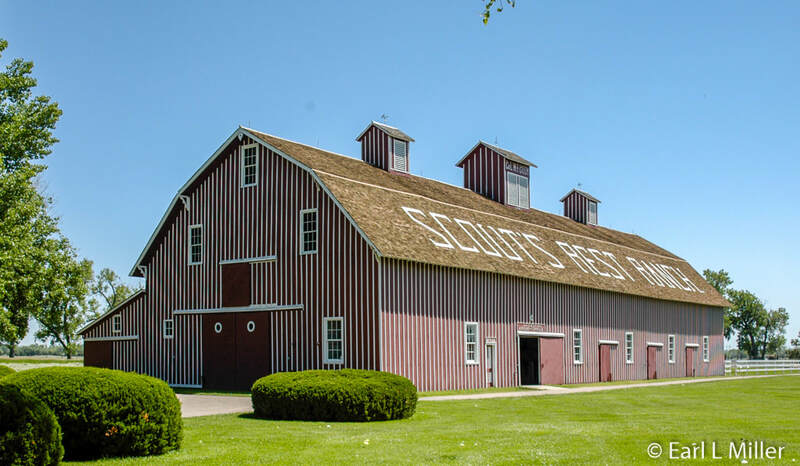 In 1887, when the big barn was built, Scout’s Rest Ranch was painted on the roof in huge letters. Today you can take a self guided tour of the home and barn. On the first floor is the den, dining room, kitchen, their daughter Irma's bedroom, and parlor. 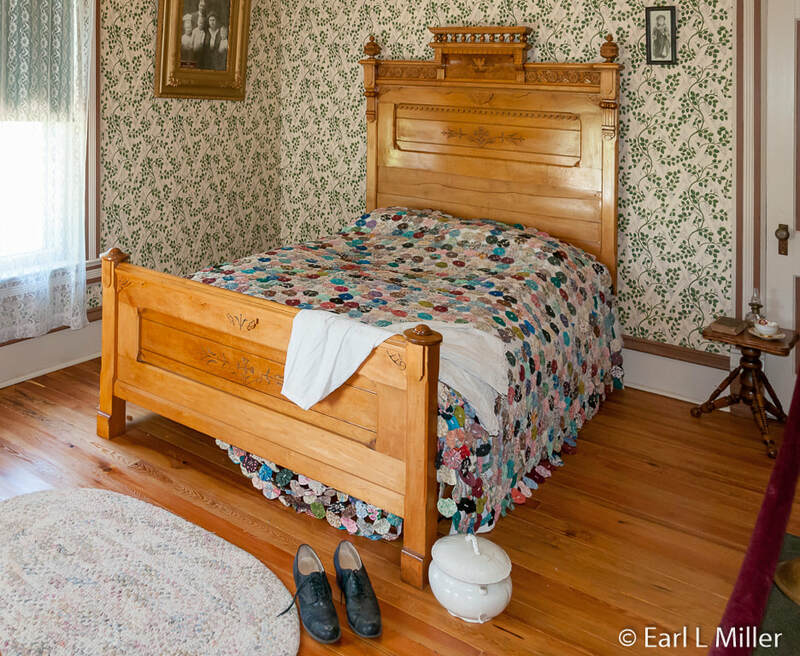 Louisa’s bedroom, male and female guest rooms, and Bill Cody’s bedroom are upstairs. It also was home to three servants’ rooms and a nursery. The third floor had a lookout to the train station. 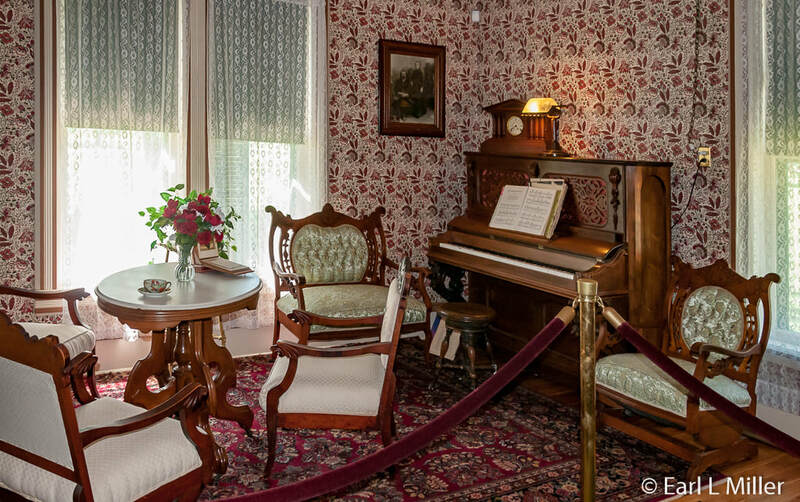 While most of the furniture is period, several pieces belonged to the Codys. This includes Irma’s entire bedroom set, the fainting couch and rocking chair in the den, the rolltop desk in the den, the secretary desk in the parlor, and Louisa’s bed. 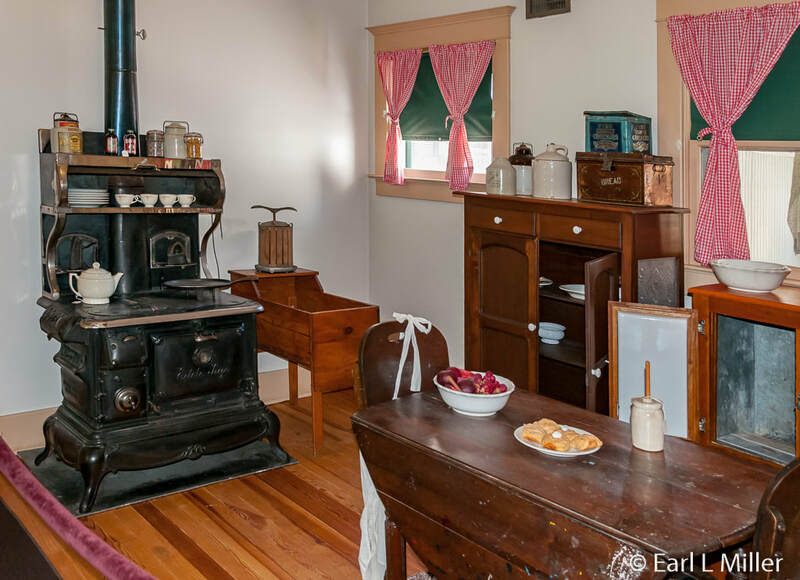 You will also see family portraits, a rocking chair in the female guest room, one of Cody’s saddles, and a few pieces of original hand painted china. The wallpaper in the dining room is an exact replica of what was there. Outside of the home, the red structure, called the Cob House, was where they stored corncobs used for kindling for the house stoves. Behind that, visitors find a tall building, the 1886 ice house. In front of the ice house, visitors discover a root cellar. There were two barns on the property. The T barn used for cattle burned down in 1904. The 1887 horse barn still exists. It’s 148 feet long, 70 feet wide, and 40 feet high. It required seven railroad cars of lumber for construction. It has 73 gunstocks on each side of the roof. 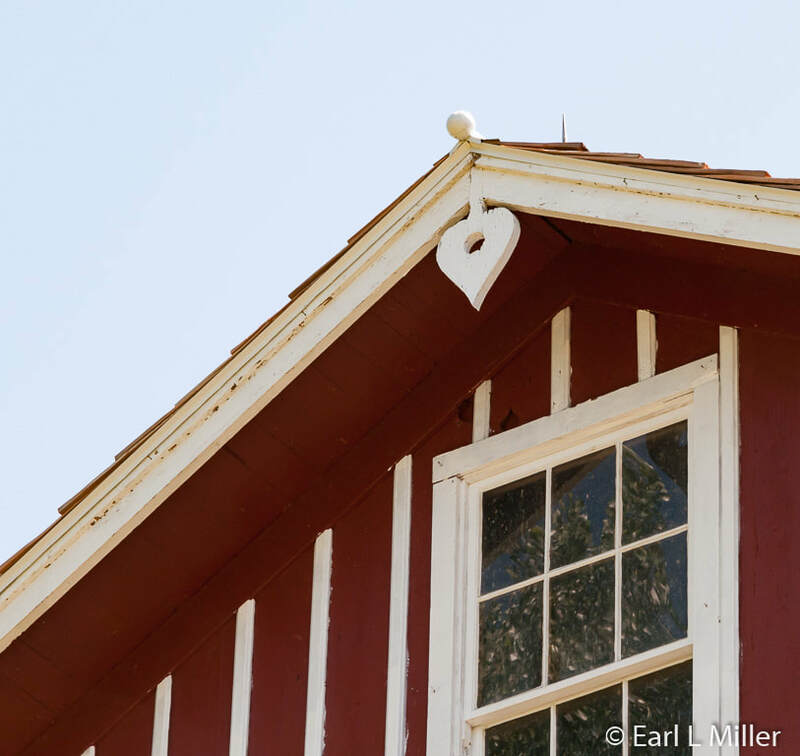 Look at the peak of the barn’s exterior for a hole in a heart. That was Annie Oakley’s trademark. She threw the ace of hearts into the air and shot a hole in the middle of the card. The ranch was founded in 1876. Cody raised Herefords, shorthorns, and polled Angus cattle as well as purebred stallions on his 4,000 acres of land. They also grew corn, alfalfa, broomcorn, and oats. The home site now consists of 25 acres while an adjacent 233-acres comprise Buffalo Bill Ranch State Recreation Area. It has RV sites with electric only as well as primitive sites. Fishing, picnicking, and hunting are available. There are five miles of hiking trails. During the summer, kayaks, canoes, and tubes can be rented, and horseback trail rides occur. You’ll need a Nebraska state park permit to enter this facility. The cost for a one day pass is $6 for Nebraska licensed cars and $8 for non-Nebraska licensed cars. A yearly pass is available at $30 and $45 respectively. 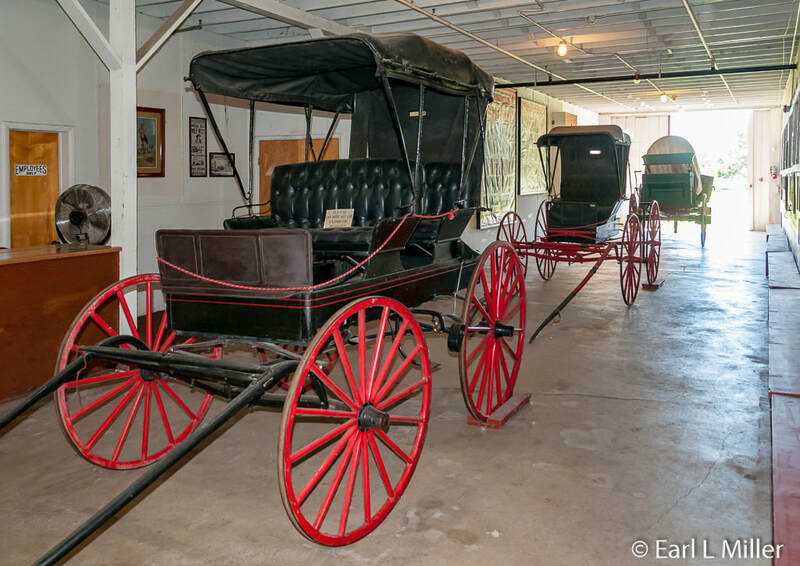 Housed today in the barn, you will find a collection of 10 to 12 period horse-drawn wagons and buggies including a Conestoga wagon. They didn’t belong to the Cody family. 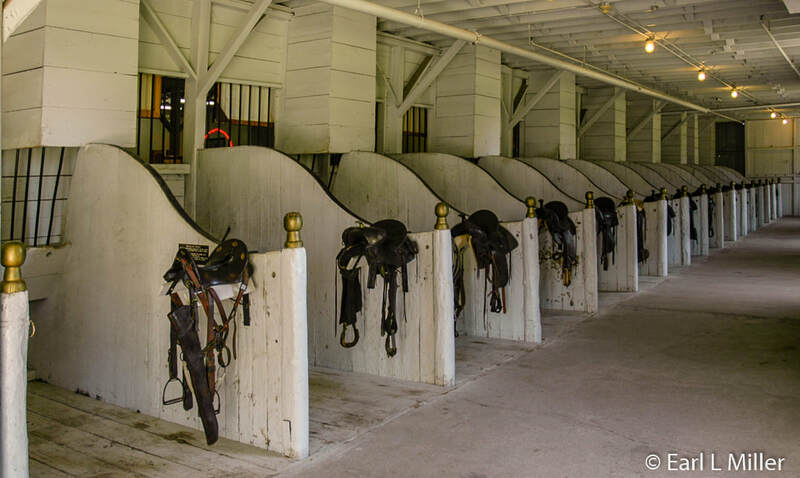 You’ll also find a room full of saddles and bridles. Look up to see two elk heads. Original posters of the show line some of the walls. You’ll also spot historic photographs of the family and their North Platte homes known as Welcome Wigwam I and Welcome Wigwam II. 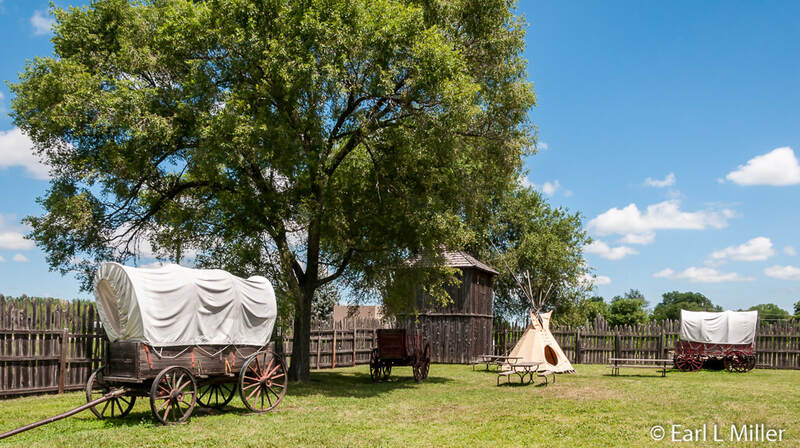 At the close of the 1911 season, Scout’s Rest Ranch, Welcome Wigwam II, and 3,000 acres were sold to his partner William Lillie (Pawnee Bill) for $100,000. The Codys remained at the ranch until 1913 when they moved to Cody, Wyoming. Nebraska Game and Parks took over the ranch site in 1960 taking five years to restore it. The Codys used to love to entertain at Christmas and the North Platte community keeps the tradition alive. The home and barn are trimmed with Christmas lights while every room has a decorated Christmas tree. Cider, cookies, and roasted chestnuts are served. They will also have carolers and horse drawn rides. In the barn is a Military Appreciation Tree. You can create your own ornament for a favorite service member. Christmas at the Cody's 2018 runs December 7 & 8, 14 & 15 and 21 - 23, 5:30pm - 8:00pm. Admission is $7 for adults and $5 for children 4 - 12. Free for children ages three and under. A valid Nebraska state park permit is required. Every Halloween, park staff convert the barn into a scary haunted barn. This makes sense since it is believed that the house and barn are haunted. Staff has heard horses in the barn. The rocking chair in the den is known to rock by itself. Meghan, our guide for the house and barn tour, has heard a woman singing when she was playing the piano and there was no one around. The park is at 2921 Scouts Rest Ranch Road. The phone number is (308) 535- 8035. A Nebraska state park permit is required. To tour the house, it’s an additional $2 for adults, children ages 4-12 $1, and ages three and under free. It is only open late April through early October except for special events. Hours are weekdays March 30 to Memorial Day and Labor Day through the end of October from 10:00 a.m. to 4:00 p.m. From Memorial Day to Labor Day, it’s open daily from 9:00 a.m. to 5:00 p.m.
As mentioned, Cody Park, known as Dillon’s Racetrack in 1882, is where Buffalo Bill Cody had his show’s start. Today it houses a memorial to Cody. The park also contains recreation areas, a collection of animals, picnic areas, and several children’s rides. The park has a railroad museum where you can climb aboard locomotives and other train cars donated by the Union Pacific. A memorial at the park’s west entrance has a gazebo and a beautiful, life-size, bronze statue of him that was donated by a British sculptor in 1998. Visitors also find a display of flags from the tours of the Wild West show and five plaques. Two relate the contributions of the cowboys and Native Americans who appeared in the show. Upon reading it, you’ll learn the Native Americans added to the show’s success by their dancing, drumming, singing, and taking part in simulated attacks. A crowd favorite was the Indian attack on the Deadwood Stagecoach. 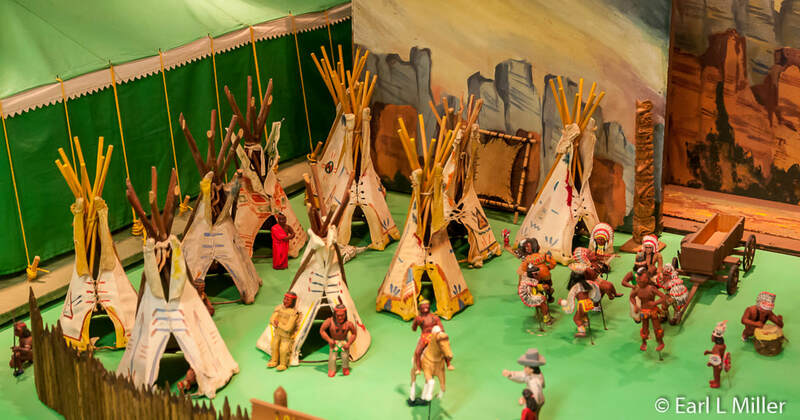 After the performance, the audience could visit the Indian village where they observed tipis, campfires, women cooking, and children playing games. They also viewed traditional tools and weapons. Another is about “Old Glory Blowout” on July 4, 1882 and how it was the start of the Wild West show and the American rodeo. One honors Roy Rogers and Dale Evans while the last is dedicated to Charles M. Evans, who portrayed Buffalo Bill from 1963 to his death in 1997. He was North Platte’s ambassador to the world. Ask people in North Platte where a great spot to buy ice cream is and they strongly recommend the Cody Park Concession Stand. You can get a cone for $1.95 in multiple flavors. We couldn’t resist and found it a creamy and delicious treat. The stand is open weekends in April and daily from Memorial Day weekend to October 1. Rides at the park include a Ferris wheel and a restored 1913 Herschell-Spillman carousel with hand carved horses. Brought to Cody Park in the 1930's, it’s a one-of-a-kind. All the carousel horses are original. Rides are open Memorial Day weekend to October 1 and can be purchased individually or in a multi ticket discount quantity. The Cody Park campsite has 40 hard-surfaced camping pads but provides no hookups of any kind. It does have restroom facilities and potable water. Stays are limited to seven days when the campground is open from May 1 through October 15. Camping costs apply. For recreation, a horseshoe pitching facility has 30 lit pits. Visitors also find eight hard-surfaced, lit tennis courts available throughout the year. The park does not charge to use these facilities. Visitors also find four lit adult softball diamonds used throughout the year for league play through the North Platte Leisure Services Department. Youngsters will enjoy the three large playgrounds. An animal enclosure contains deer, elk, burros, llamas, buffaloes, peafowl, ducks, and geese in a natural setting. There is no charge to view these. We spotted two donkeys, an elk, and three buffaloes while driving around the park. During the summer months, concerts are held in the park at the open air pavilion. During the winter, it is used from the first Monday after Thanksgiving through December 25 for Santa’s Workshop Display. Those who love trains should explore Cody Park’s Railroad Museum. A highlight is the Union Pacific Challenger 3977. You can go sit in this locomotive for an engineer’s view and then walk through attached mail and baggage cars as well as a caboose. It’s the only one of its class, a 4-6-6-4 Challenger type Mallet, on display in the world. Built in 1943 for freight and passenger service, it was retired in 1961. It reached speeds up to 70 miles per hour. 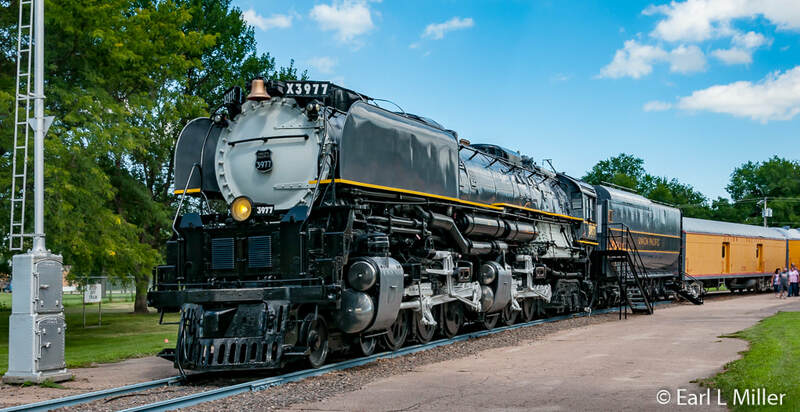 The locomotive is 121 feet 10 inches long, 16 feet 4 inches high, and 11 feet 6 inches wide. It has a tender capacity of 28 tons of coal or 5,945 gallons of oil and 25,000 gallons of water. 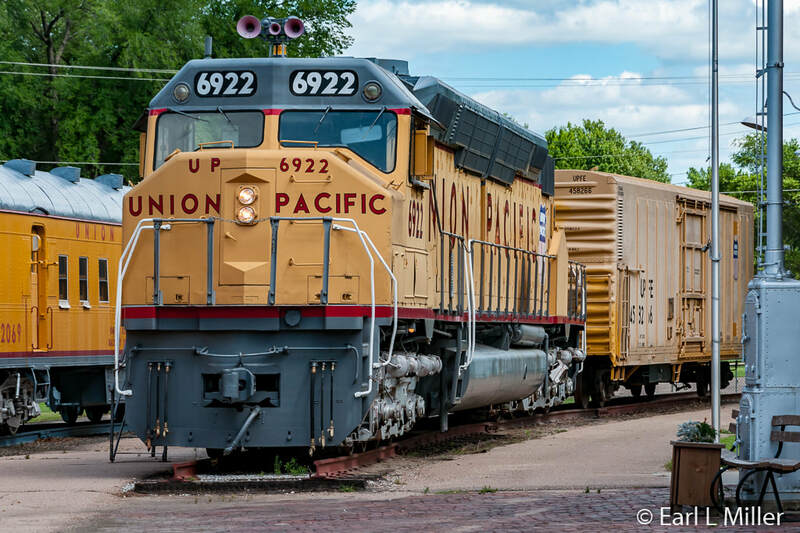 In addition to this magnificent locomotive, visitors find Union Pacific’s 6922. The 6900 diesel locomotives were the largest ever made. They can also enter the restored Hershey, Nebraska depot to see historical train artifacts. The museum is open from May through September. Cody Park is located at 1601 N. Jeffers Street. The telephone number is (308) 535-6700. Except as noted, there is no charge for its attractions including the train museum. 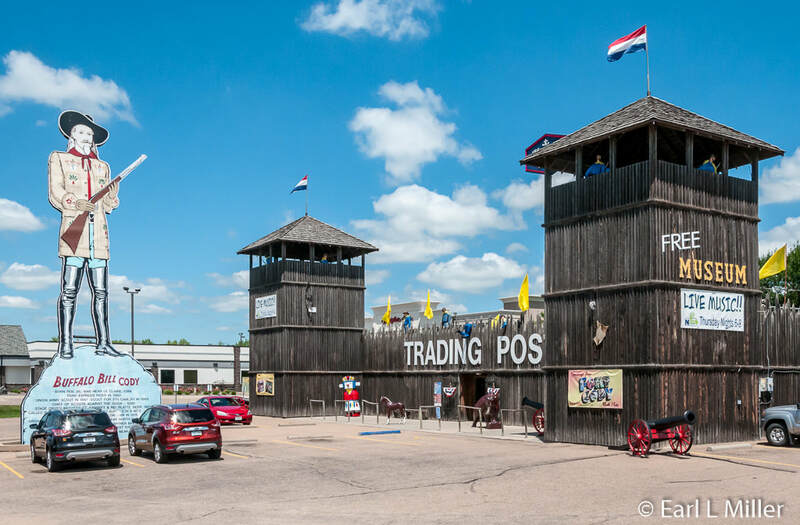 Recognized as Nebraska’s largest souvenir and western gift shop, Fort Cody Trading Post is one of North Platte’s favorite family attractions. 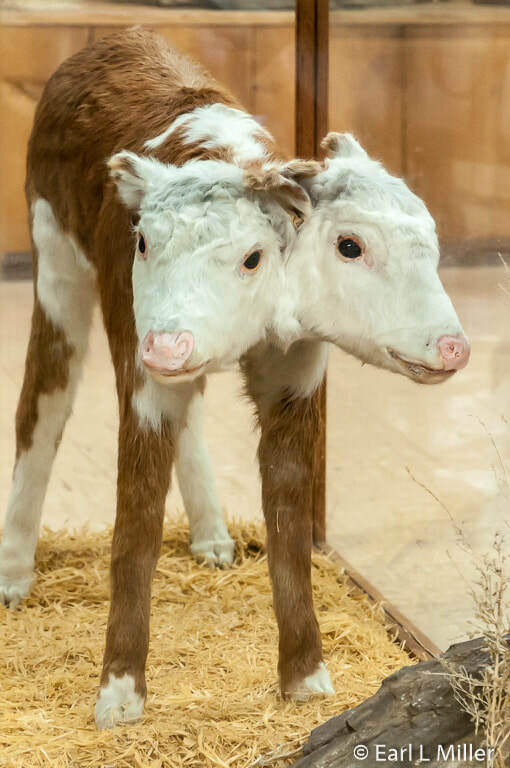 Visitors view a two-headed calf, see a small Old West museum, and enjoy a Buffalo Bill’s Wild West Show in miniature. But that’s just the start of it. The post is in a replica of a log frontier stockade of the 1860-1875 era. Look around the outside and you’ll see mannequins manning the towers and battlements. Unfortunately, one has an arrow sticking out of his hip. You’re greeted by a 30-foot Buffalo Bill Cody including a sign listing some of his life’s highlights. We met with the owner, Chuck Henline and his son, Nick, who is in training to take over. 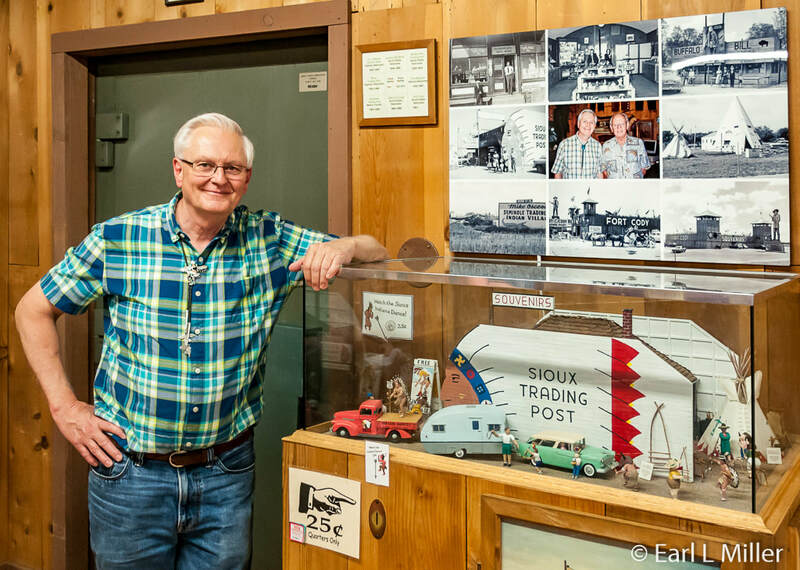 Chuck’s father, Royce, and Doc Dunlap, a traveling salesman who peddled postcards and horse clocks, started Fort Cody Trading Post in 1963. The first was located on the Lincoln Highway, Route 30, in North Platte and closed in 1968. The second, at today’s site, was built to coincide with the opening of Interstate 80 in 1967. Before Fort Cody Trading Post, the extended Henline family operated several stores. Their first was the G. L. Henline General Store in Atlanta, Nebraska from 1925-1950. They also operated the Sioux Trading Post from 1952 to 1969 in Ogallala, Nebraska; the Wigwam from 1952 to 1981 in Atlanta, Nebraska; Buffalo Bill Trading Post from 1950-1953 in North Platte; and Mike Osceola’s Seminole Trading Post in Miami, Florida 1955-1959. 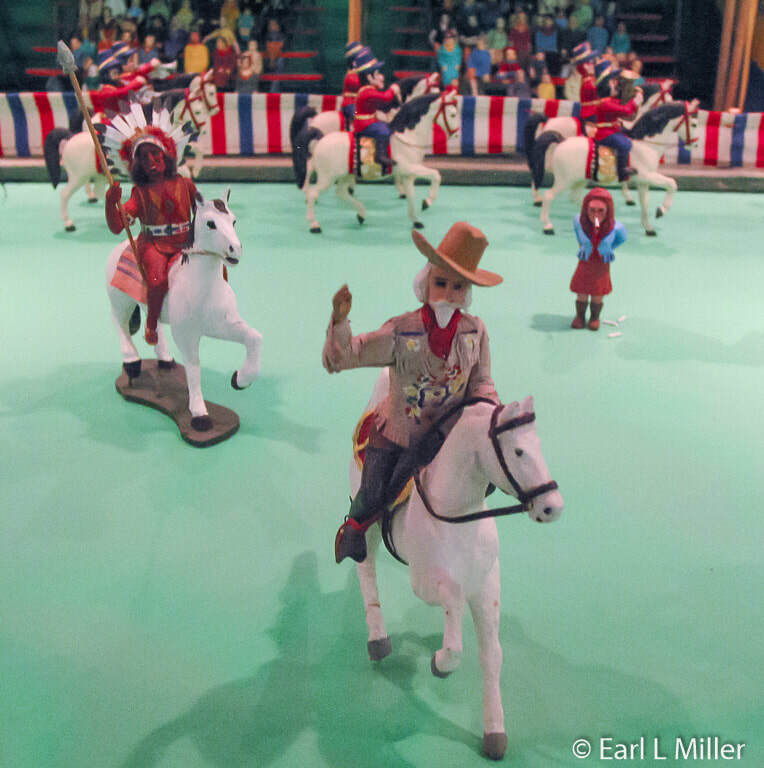 On the half hour, visitors watch a free five minute show as Buffalo Bill’s Wild West in Miniature comes to life with many animated figures. They see a grand parade, a group playing cards, a shootout, Indians dancing, a cowboy lassoing a running bull, and Brahma bull riding. 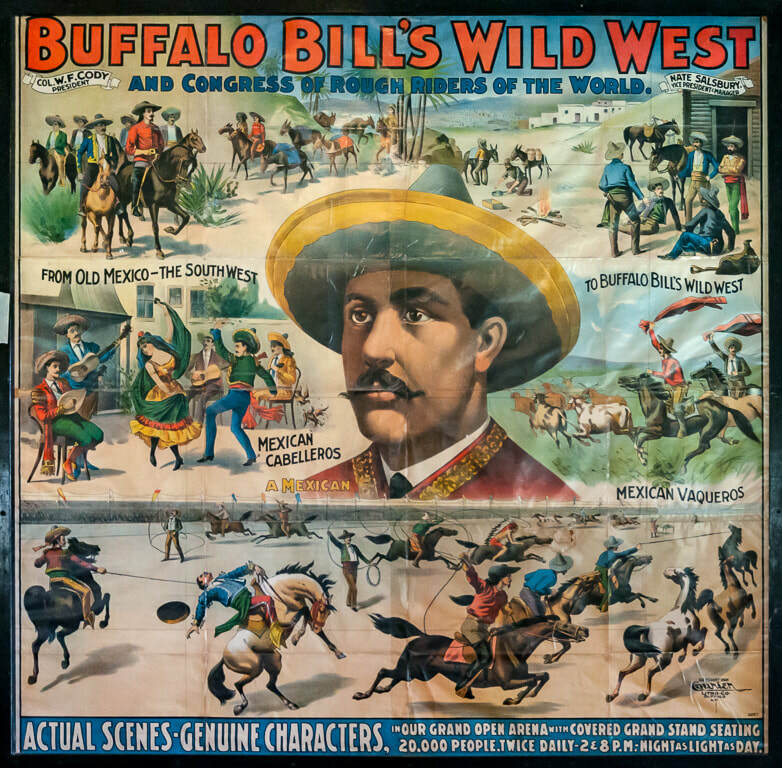 One figure represents Buffalo Bill. Ernie and Virginia Palmquist created these 20,000 hand-carved pieces out of basswood over a 12-year period. It is one of the largest single folk art displays in the country today. Ernie, a big band leader during World War II, attended Buffalo Bill’s show as a child and actually met Buffalo Bill. This inspired him years later to make this one-of-a-kind presentation. 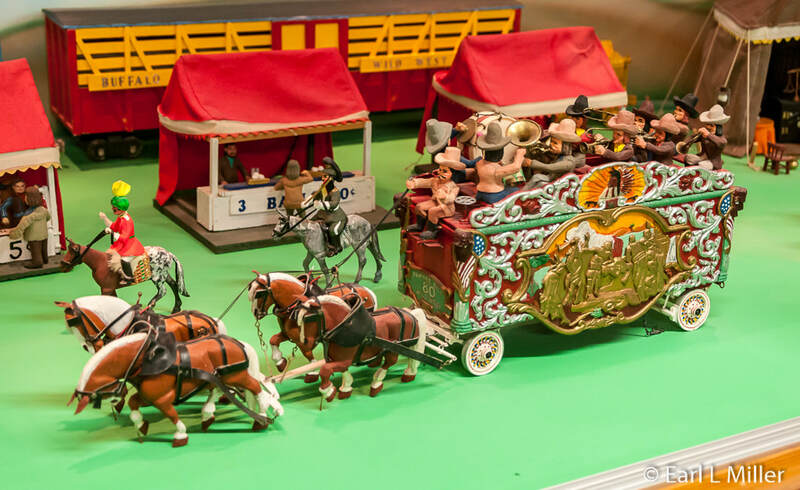 He first made a circus out of wood which he worked on for 10 to 15 years. He also made a Santa Village. An avid traveler, after creating the Wild West show, Ernie would display it at various malls. In 1969, he sold it to Nebraskaland Days, an annual celebration held at North Platte. In 1977, the Henlines purchased it and hired the Palmquists to help set it up in its new permanent home at Fort Cody. In the 1990's, Chuck himself carved, painted, and added the shootout scene. 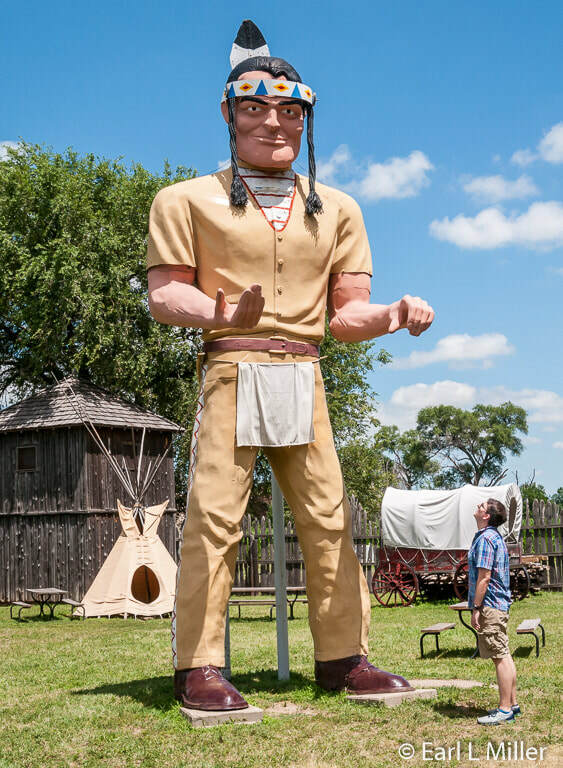 The Whitecalf family of the Sioux Pine Ridge Reservation in South Dakota performed Native American nightly dances at the Sioux Trading Post in Ogallala and then the Interstate 80 location of Fort Cody Trading Post until 1977. This included the challenging hoop dance. Chuck created a scene that you can play for a quarter where the Indians become animated and dance. There is even a little Chuck in the scene. He worked on it every night for an entire winter. “No television that year,” he told me. Their western museum is small but has several unique items. Look for the two headed calf which the family obtained in 1948. It was their first acquisition. The calf was born on a ranch in Stapleton, Nebraska in the late 1940's and lived for only about 48 hours. Chuck has been the family collector of cowboy artifacts while his father’s concentration was on Indian artifacts. The family has received a few donations from area ranchers and farmers. 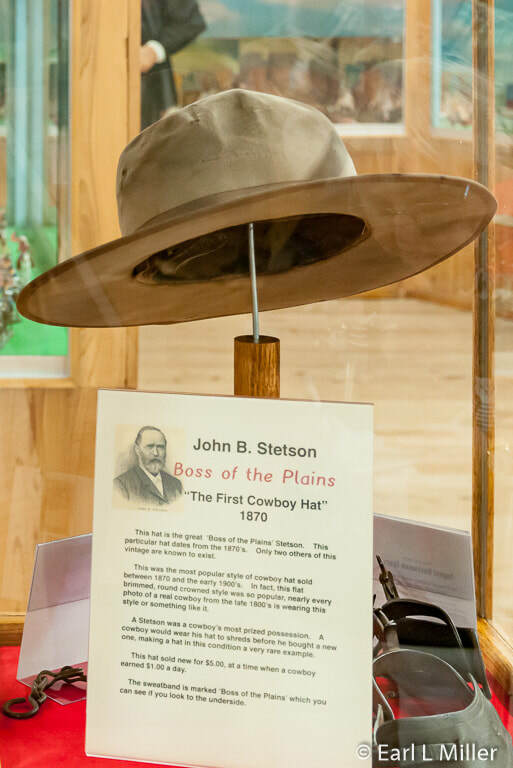 They have a 1870 “Boss of the Plains” Stetson hat, the first cowboy hat. The only other two of this vintage known to exist are in the Cowboy Hall of Fame in Oklahoma City and the Gene Autrey Museum of the American West in Los Angeles. From the late 1800's on, every photograph of real cowboys had them wearing this hat or something similar. The cowboy’s most prized possession was his Stetson hat. He literally wore it to shreds before replacing it. A hat in the condition of the one at Fort Cody is very rare. A Stetson would sell for $5 when cowboys were only making a dollar a day. Visitors will also see the first cowboy boots - Coffeyville Boots, circa the late 1870's. They are reminiscent of cavalry style boots. However, they have higher heels, more pointed toes, fitted tops, and are made for right and left feet. 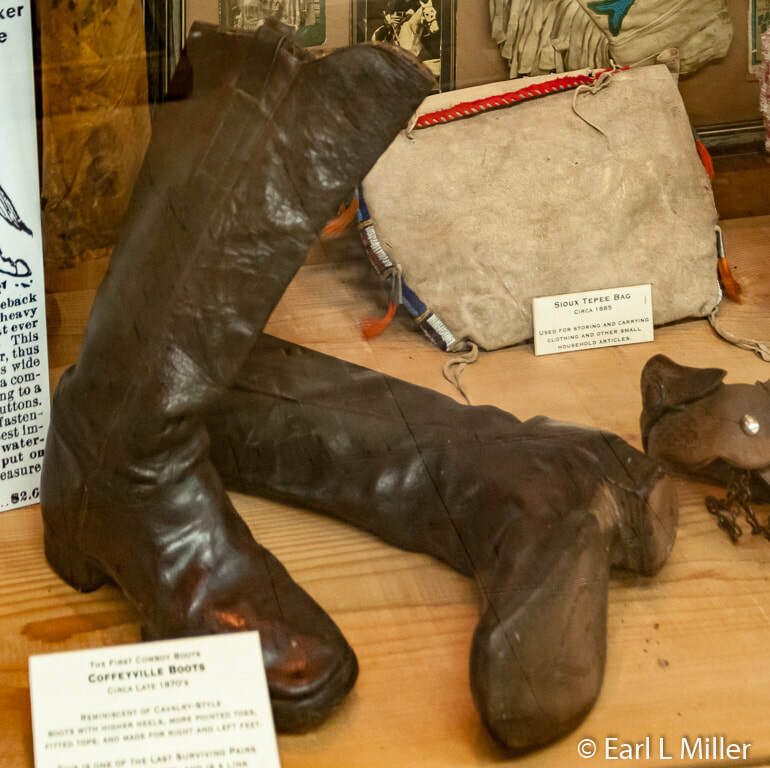 This is one of the last surviving pairs of these boots that were worn during the cattle driving days of the Old West. On display are chaps, guns, hats, saddles including a rare 1880's J. S. Collins saddle, and other cowboy gear dating from the late 1800's through early 1900's. You’ll see a buffalo hunter’s coat and different pelts such as an opossum, skunk, and mink. Buffalo Bill is represented, too. On display is a model of the Scout’s Rest Ranch home, an original photograph of him, hand painted china about the ranch, and costumes from the show. They have signed letters from Buffalo Bill and Louisa and a mannequin of Cody. There are six murals depicting key moments in Cody’s life on display that were painted by artist Gene McConnell. Visitors should explore the stockade out back. They’ll see a wagon train, tipi, log cabin, and jail. The highlight, however, is the 20-foot high muffler man. In 1970, a gas station across the highway from the Fort wanted to sell their Muffler Man. Chuck’s dad offered him $100. The gas station owner dragged the Muffler Man across the highway and left him lying in the Fort parking lot. The Henlines set him up and made him to look like a Native American. He is one of only a hundred Muffler Men left in the country today. During the summer, on most Thursday nights, they host a Summer Music Series. The 2018 schedule featured live bluegrass and country music at a very reasonable $5 admission per person. The store is impressive. 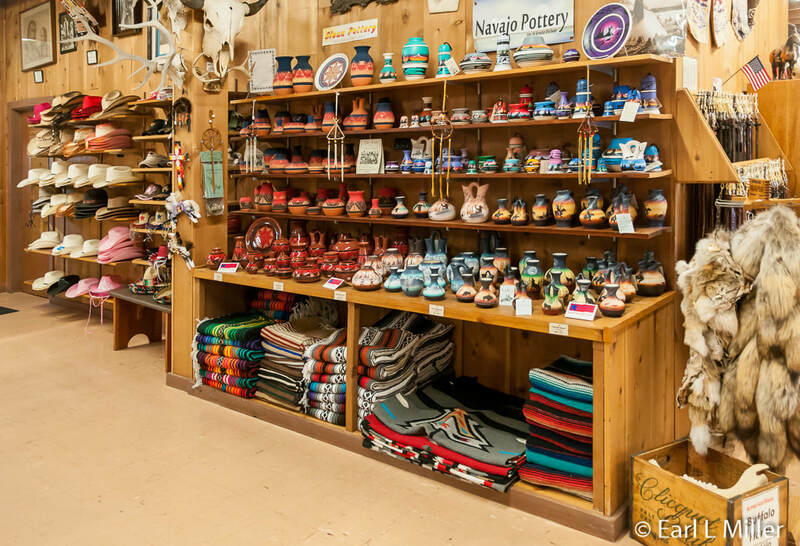 From blankets and pottery, to moccasins, jewelry, clothing, and Nebraska food products, Fort Cody is the place to shop. They have lots of Nebraska souvenirs while their bookstore has 1,000 titles including many children’s books. Fort Cody Trading Post is located at 221 Halligan Drive, the intersection of I-80 and Hwy 83. You will find Fort Cody Trading Post open throughout the year. Hours are seasonal. Summer hours (Memorial Day to Labor Day) are 9:00 a.m. to 9:00 p.m. daily. Winter hours (November 4, 2018 to March 19, 2019 ) are Monday-Saturday 9:00 a.m. to 5:30 p.m. and on Sunday from noon to 5:30 p.m. During the rest of the year, the hours are Monday through Saturday 9:00 a.m. to 6:00 p.m. and on Sunday noon to 6:00 p.m. Remember: You can sign up for the free notification list for future articles by filling out the form on the Contact Sheet. Don't forget to give us your city and state. We never give out emails or personal information.